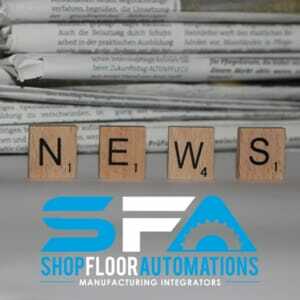 The following is an archived copy of the 2017 June/May Shop Floor Automations Newsletter. It is amazing how much hardware changes our daily lives. Your smartphone, your FitBit, your home assistant devices like Amazon Echo or Google Home – hardware helps improve your life in so many ways. Why not invest in some new hardware for your shop floor? Add USB to any machine. Drip-feed programs that are too large for your CNC memory. Replace floppy disks or poorly insulated cables that are dropping your program transfers. Coming soon, use hardware that can function via WiFi, RS232 Serial, Ethernet, PLC, and the MTConnect protocol, at the same time. There are so many options at a very affordable cost. Our customers have turned to our hardware to solve many shop floor problems. One customer found that his company could save money and not risk damaging their shop’s laptop by using our Portable USB Connect instead. Another customer who has been with us for over a decade has been using our wireless CNC machine networking devices in their shop for years. Another customer loves the process control and security of his shop’s programs from using our hardware devices. Just ask us about other hardware benefits! Have you ever bought hardware from some off-the-beaten-path discount store, or purchased cheap software, and have been dismayed at the lack of support or detailed documentation? It is so valuable when a technology company offers support for their products, and when offered, it may cost less than you think. SFA is proud to have some of the best technicians in the manufacturing integration business. They not only offer support over the phone and via remote sessions for customers, but they can also come on-site to help. We have some great resources on our website that explain why it is a great idea to use a technician instead of attempting to do it yourself. Sometimes cabling can be a little more difficult than you may have thought previously, which you can read about via another blog post. We also did a post on how setting up hardware can be a little more complex than you imagined. For more info, send us a message, or call (877) 611-5825. See the original newsletter.